This free Data Governance Checklist gives a high-level outline of the tasks you need to do to successfully design and implement a Data Governance Framework that is right for your organisation. In an easy list format, so you can plan and tick off the actions. My Data Governance Checklist gives you a high-level outline of the activities you need to complete in order to successfully design and implement a Data Governance Framework. 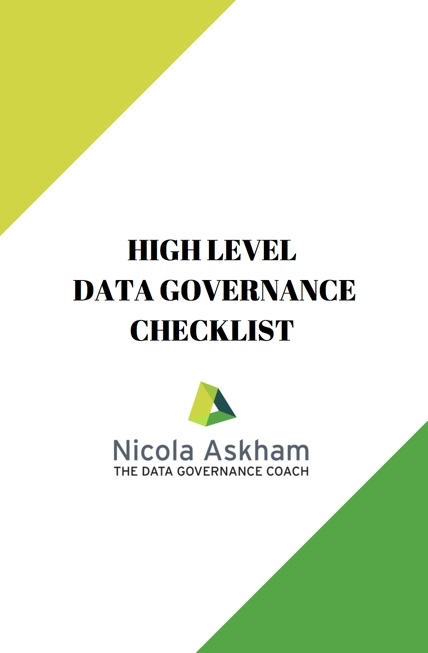 Please note that the full version of this checklist, with detailed tasks, is only available to those who complete my Data Governance training courses. Please enter your details below to receive my newsletter with useful data governance tips, news on events and other opportunities to be more successful with your Data Governance initiative. The first thing you will receive is my free Data Governance Checklist. You can unsubscribe at any time. Please add nicolaaskham.com to your email's safe senders list to ensure my emails reach you.